Volunteering > Volontaire un jour, bénévole toujours! An effective volunteer story was published in Vivre à Genève, publication of the city of Geneva. 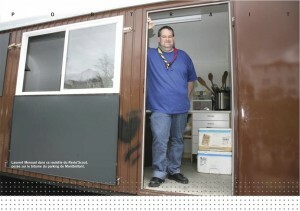 Laurent Menoud is running the Resto’Scout where hot meals are served to people in need. The Resto’Scout serves about 150 persons per Sunday with a budget of 200 CHF. Laurent mobilize every weekend a team of volunteers for collecting the goods, preparing and serving the meals. Laurent joined the Scouts at very early age and spent time in various troops in Geneva. Several years ago, he discovered, by accident, the Resto’Scout and now managing it as a volunteer, being present Sunday after Sunday. The Resto’Scouts has to be closed three of four times a year when tensions are raising during the service or when there is not enough volunteers for the service. But in the meantime, when Laurent is getting more money, he is preparing bigger and better meals and even more people are coming.